Now that's how you do an anniversary. The Japanese Dragon Quest Collection contains Famicom and Super Famicom versions of Dragon Quest, Dragon Quest 2 and Dragon Quest 3, but it also comes with something a little more future-facing. Square Enix announced the game will hit Japan on 15th September, priced ¥4,440 — approximately £34/€38/$54. 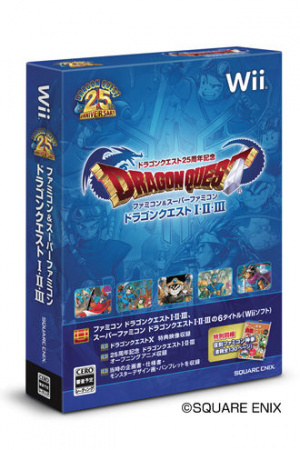 While this would be steep for just an anniversary round-up, the collection is now more notable for containing a clip from long-awaited Wii RPG Dragon Quest X, which despite years of development still is yet to be seen in any form whatsoever. Most notable for the DQX clip — whatever form it may take — the collection also includes reprinted guides for the games, a souvenir Small Medal, an artwork gallery on the disc and brand new anime sequences created by Kamikaze Douga. All-in-all, not a bad bundle for your wad of Yen. No word currently on whether this 25th anniversary collection will make it to the West. GRRRRR want to import. Please bring it to the US...I'll buy it. I dunno if anyone else in this country will, but I'm down, and I'm pretty darn important. skyward sword? that would have made a mint. That looks like a really nice package - would be good to see a PAL release! They would have to translate the three SNES remakes and probably redo the outdated NES traslations (not to mention the whole printed material) which sound almost impossible to me. But God I wish that I was wrong — especialy when the WiiU is backwards compatible. BTW, its good to hear that we'll be able to see some DQX images soon. $50-$60? Not sure if I'd buy. Buying the old games would only cost $30-$40. See with the Mario All-Stars package, the cartridge alone for the SNES goes for $30, so it was worth the value for the extra stuff. I'm tempted to invest in a Japanese Wii for this. Pleaaaaaaase bring it in Europe too! I hope this see's release outside of Japan. Get on it Nintendo! Release the GBC not the NES versions and I'll buy it. yeah i want the gbc ones on 3DS vc but if this comes to the us id buy it for sure. Can't say I'd be too interested in this as anything more than a collectors piece. I'd much rather see them do full remakes of the original three, at least to bring them up to the standards of the DS IV, V and VI. We badly need VII and VIII on the 3DS too. I want that Trilogy in EU too. Never played any of the DQ games (except DQ Swords) because these games weren't released in Europe. DQ1 (and 2 and 3) would be a good start to get into the main series. Bring it over in that nice shiny blue box. Would love to play the early games, and that collection will be great. At least we'll get to see some DQX footage soon though. YES!!!!! Please, Please bring this over here. Not only do I want to see that clip I want to play those 3 games. I hope the video makes it on to the net, been anxiously waiting for this game. Dragon Warrior will forever be a part of my childhood and fondly remembered for my first RPG experience. If this compilation was released in North American and Europe, we would have NES versions only. Oooh, that box looks purdy! I think this being published outside of Japan is extremely unlikely. I could see Nintendo putting the NES versions up on Virtual Console though. Individually, of course. Desperately looking forward to this game.